Podcasting is in vogue, there’s no denying it. In 2018, there are a lot more people listening to podcasts than even a few years ago, but this also means that there are quite a few more people producing podcasts. This includes billion dollar corporations and media giants as well. Competition is a good thing though, it weeds out the stuff people are not interested in and it raises the bar for everyone. Take voice lessons – you might not have considered it, but getting a professional voice coach is a great investment. This certainly isn’t a prerequisite, but it can definitely help you get to the next level. Voice coaches aren’t just for singers, they’re for any auditory performer and can help you work on your delivery, mechanics, energy and pattern. Doing so may help you identify weak points in how you speak, and it may teach you to use pauses more effectively. Work on public speaking – podcasters can hide in their basement behind the mic if they so choose. But in reality, it’s just another form of public speaking. Giving speeches to a live audience can help you improve your podcasting game a lot. You can gauge reactions, calibrate your delivery and up your confidence. Give toastmasters or something similar a try. 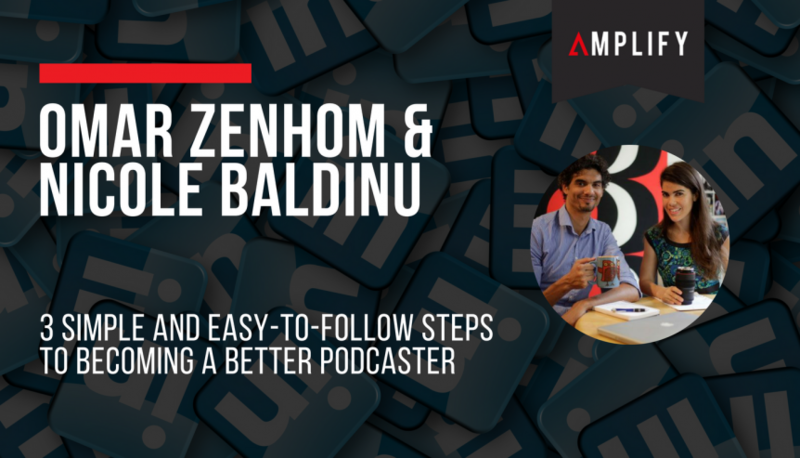 Practise, practise, practise – everyone can talk, but practice and refinement are big keys for those who become master podcasters compared to those who remain relatively mediocre. Omar is constantly asking himself, How can I get better? How am I going to beat my competition? How can I keep pushing? Take his approach, put in the work, and create a better podcast for your listeners by becoming a better speaker. Listen to my entire conversation with Omar and Nicole here.